Autoclave can be defines as a pressure chamber which is used to carry out industrial processes requiring elevated temperature and pressure different from ambient air pressure. Steam autoclaves are used in medical industry to sterilize the equipments before using them. Sterilizing equipments is the standard and mandatory practice in the healthcare industry to avoid and reduce the risk of infection. Globally increasing surgeries and increasing healthcare care spending in developing economies is expected to remain key growth driver during the period of study. However growing popularity of the disposable equipments is expected to remain as a major restraint to the growth of the overall industry. Geographically North America dominated steam autoclave market driven by best in class infrastructure, best in industry practices, higher number of surgeries and higher spending by the citizens towards healthcare expenditure. North America was followed by Europe and Asia-Pacific as second and third largest market for steam autoclave market. Asia Pacific is projected to have fastest growth, owing to rapidly developing medical infrastructure, increasing medical tourism, increased spending, and increasing awareness amongst population in developing nations such as China, and India in this region. This report identifies the global steam autoclave market size in for the year 2014-2016, and forecast of the same for year 2021. 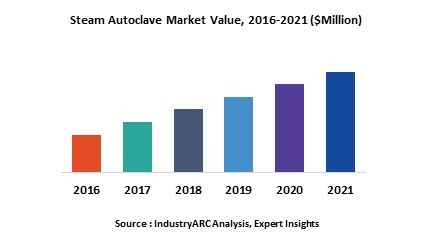 It also highlights the market drivers, restraints, growth indicators, challenges, and other key aspects with respect to global steam autoclave market. 11.8. SAKURA SI CO., LTD.